Need Shade? Pergolas Give Instant Results! I promise to use it only to send you Landscape Update. Need shade over a patio or by a pool? Pergolas may be the answer. They are open roof structures of girders and cross rafters that provide shade and bring a nice element of architectural detail to your landscape. A large tree that reaches over you providing cool shade is the ultimate solution, but unfortunately is not always available or may be too messy for some situations. This structure of natural rough hewn timbers was designed by Dan Ensminger, an architect in Richmond, VA. I did the planting and herb garden design for this project and Dan did all the structural garden elements as well as designed the house. Look at how nicely it fits under the roof line. The spacing and types of top members provide a light, filtered shade that lets enough light in to grow plants under it. The design can incorporate architectural elements from the house, so it looks like a natural extension of it. For example, the posts can match the style of a post used on the house. The ends of the horizontal members that make the top can be cut to match a detail on the trim of the house. This design tip is especially important when it is attached to the house or right beside it. Matching the color to the trim or house makes it a natural extension of the house as well. Notice the same type and color of timbers are used on the back of the house. This same timber is also incorporated into the front of the house. It looks like its been there since the house was built. However, it is an addition. 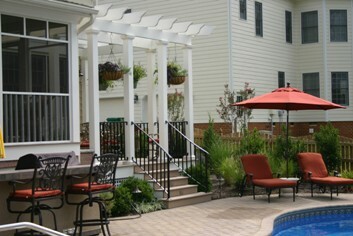 Pergolas that stand alone and are a destination point in the landscape can be effective focal points. Beautiful columns or brick piers can support a structure of cross members of an interesting design. Being detached from the house lets it take on a design of its own giving the landscape a distinctive style. Consider the amount of shade you want on the area below it. Some people like the appearance of a garden structure without needing much shade. In this case, the top members are put far apart. A distance of 18-inches between cross members does not provide much shade. The closest I have specified them is 6-inches on center. It was by a pool where a shaded area was needed. When total shade is required, the top members may also support cloth shades. There are a few brands on the market that operate on this type of structure. Also, two tiers of structural cross members give double the sun protection. This pergola was built by a swimming pool and the owners needed as much shade as possible. 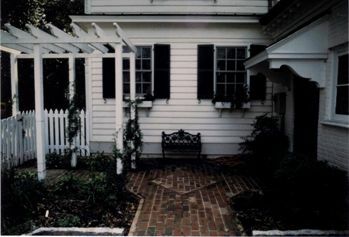 All the lumber was composite and the style of the arbor was in keeping with the traditional style of the house. The colored drawing represents the top members. 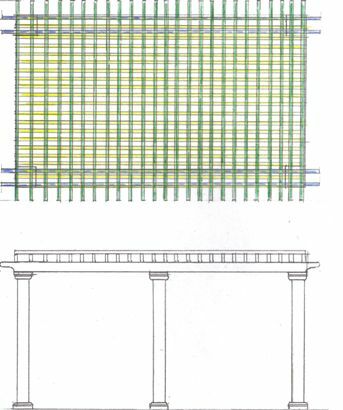 The blue colored lines are the 2"x6" members that you see with the decorative end in the elevation drawing. The green lines are another layer of 2"x 6"'s also with a decorative end and going in the opposite direction. The yellow lines are 1"x 4" members, 6-inches on center. The double layer of 2"x6"'s and the third layer of 1"x 4"'s keep the people below it very safe from the harmful sun's rays. Low maintenance is of utmost importance these days. No one wants to have another thing to paint. Use masonry products like brick and stone for the vertical support. Fiberglass posts or columns do not rot and do not need to be painted. Rough hewn beams, composite lumber and vinyl are good choices for the top members. Salt-treated lumber does not need paint, but has some characteristics that need considering. It fades to a gray color and weathering causes it to crack and warp. Definitely use a sealer or stain on it to protect it from showing signs of deterioration. This is outdoor living at its best! The covered deck makes a natural transition from the screened porch to the swimming pool. 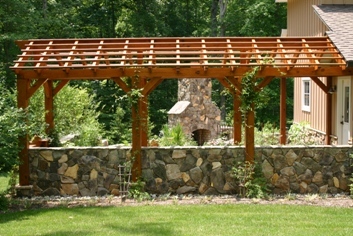 The pergola provides shade and a place to support hanging plants for seasonal color. The height is very important. You do not want it to feel so low that you can hit your head on it. I do not design them lower than an 8-foot height. The best place for them to attach to the house may determine the height. They need to fit nicely against the house at a place that does not obscure any windows or cover an important architectural detail. How it looks with the roof line of the house is important too. Determining the height in this situation is specific to each individual project. In most cases, it is installed under the eaves. I have done pergolas that are close to the house, but not attached and have been taller than the nearby roof line. Basically, they should not look like an afterthought. It should look like it has always been there and be comfortable. The width is determined by its purpose. Is it covering an existing patio or deck? Is a certain size shady area needed by the pool? The challenging aspect of designing a large pergola is to keep interior posts to a minimum. They get in the way, but are necessary for support. The thicker and wider the horizontal beams, the more distance they can span which makes for fewer interior posts. Reference span charts for the maximum allowable span for the size and type of lumber you use for the top members. Composite lumbers (synthetic) are wonderful because they are heavier than vinyl, available in colors and do not need painting. Each brand of composite lumber may have different properties that you should learn about before using them. The span strength is important as well as any special instructions on spacing and how best to fasten it (nails, screws or hangers). When specifying a composite lumber, I always use a consultant from the manufacturer to check the detail of my design. They are very helpful in assuring that the spans of the top members and load bearing capacities of posts are correct. New materials are hitting the market constantly and who best to help you then the manufacturer. Covered walks are charming! This pergola stands away from the house and covers the short walk to the back yard. The evergreen Carolina jasmine has just been planted on the posts, but will soon spiral up the post and drape over the pergola. It is in perfect unison with the white house and picket fence. The architectural detail over the back door is repeated on the ends of the top members. When fastening any type of lumber with nails or screws, drill the hole for the fasteners. You will have less cracking and chipping. You can also sink the head of the fasteners making them less noticeable. Questions? I have answers! Take advantage of my years of experience to help you solve a problem. Ask me a question. I will give you a quick response and a page on this site dedicated to the topic. You can share it with your friends and the readers will appreciate it too. I hope to be hearing from you! Please contact me for further information or to talk to me about my design services. 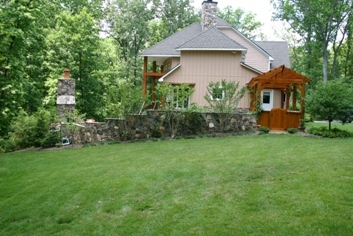 Related Pages: Back Yards, Swimming Pools, Patios and Small Yards.